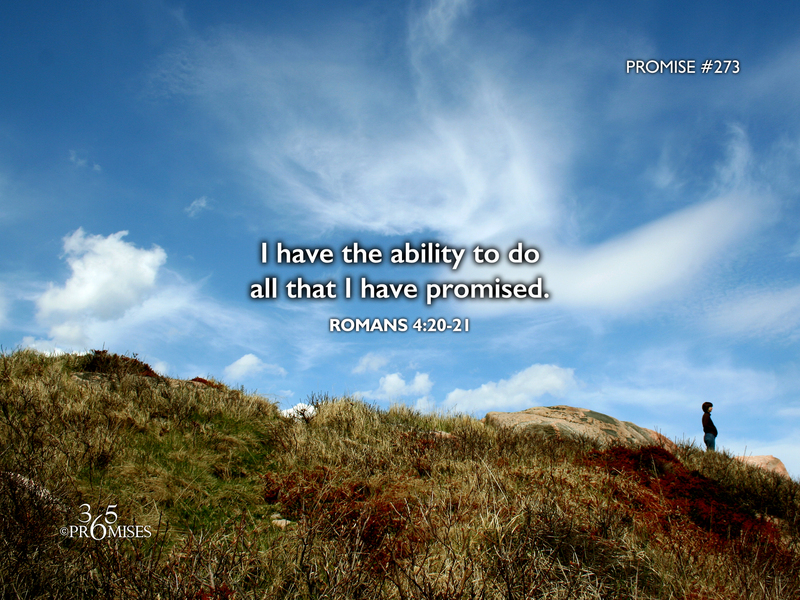 I have the ability to do all that I have promised. This is an amazing picture of one man's simple faith in the faithfulness of his God. Just prior to these verses in Romans 4, Paul is talking about Abraham and how he hoped against hope in the face of impossible circumstances. God had promised Abraham a son to be born by his 90 year old wife, Sarah. Though Abraham himself was nearing 100 years old, and his aged body was hardly in the right condition to have children, he believed what God had promised. The NIV Bible says verses 20-21 this way... 20 Yet he did not waver through unbelief regarding the promise of God, but was strengthened in his faith and gave glory to God, 21 being fully persuaded that God had power to do what he had promised. Abraham didn't waver in his faith but was fully persuaded that God had the power to do all that He promised. Always remember that when God makes a promise to us, He has the power to perform what He has promised, no matter how impossible the circumstances! Who would have thought that this simple act of faith by an old man and an old woman so many thousand of years ago would have such ripple effects throughout history! Because of Abraham's faith that God was who He said He was, we are reaping the benefits today. What has God promised you? You never know what ripple effects there might be because of your simple obedience to believe that God has power to do all that He has promised! Don't waver through unbelief today, but believe with all your heart in the faithfulness and power of the One who made the promise.